So. Let me first say that I have never heard of e.l.f. Cosmetics until I received some e.l.f. nail polish from my aunt last December. In case you are like me pre-December, and don’t know of this brand, e.l.f stands for Eyes, Lips, and Face. Which is kind of funny, because nail polish doesn’t go on your eyes, lips, or face. 🙂 But, yeah, they have nail polish. I took a look at their website the other day, and saw that all the makeup is really cheap. And the nail polish is only $1. So… I’ve heard some people say to be aware when using their make up. Well, I don’t use their make up. Just some nail polish. I have five polishes from e.l.f. and I have fallen in love with two colors. Sunset, and Royal Purple. 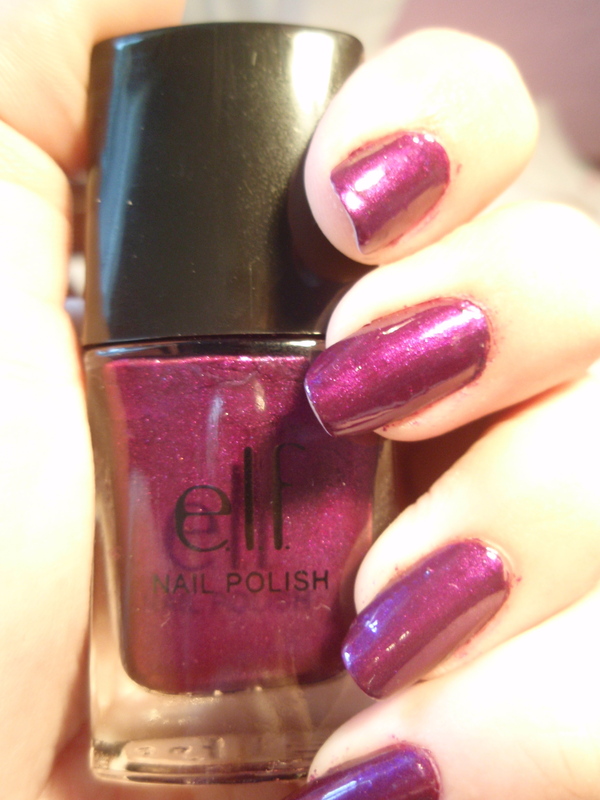 Here is my review on e.l.f.’s Royal Purple. Here is a photo of the bottom of the bottle and the bottle itself. The color is gorgeous. In real life, the color is deeper, and more purple than the photo. The photo makes it look almost like magenta, which has a more red color, while Royal Purple is by no means magenta, it is purple. I used 3 coats. The more coats you put on, the darker it will look. 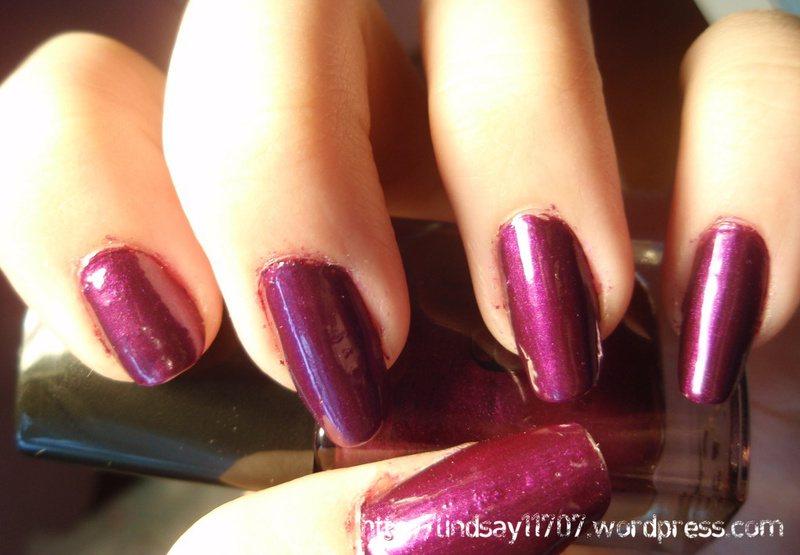 So just one coat looks kid of like the color in the photo, while 2 or 3 coats makes the polish on the nail a deep, dark-ish purple. I don’t know if this is with all e.l.f. 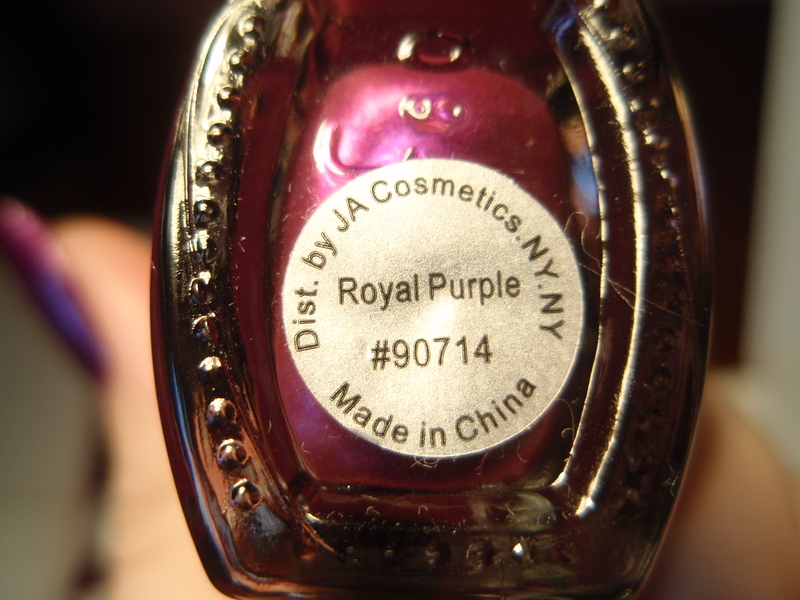 nail polish, but when I used Royal Purple today, it was slightly gloppy and thick. This was just my experience with this color. I’ve had this bottle since December, and this is really the only color I used out of my 5 bottles of e.l.f. nail polish, so it’s been frequently opened and exposed to air, so I’m guessing that’s why it’s thick while the other polishes are still fine. My favorite all time brand is China Glaze. They just have so many amazing colors. Just saying. So… if you’ve ever tried e.l.f. Cosmetics, what are your thoughts about it? I would love to get some opinions. ALSO! If you know of any other brands that have a color polish similar to this, please let me know! Because I love this color. Rhinestones, Nail Art, and Konad!